A Welsh health board is upping the calories in meals given to its care home residents in order to stave off problems with malnutrition, especially in dementia patients. Abertawe Bro Morgannwg health board is serving higher-calorie meals and snacks so residents do not have to eat as much in order to get the energy they need. Dietician Jo Betty said that reduced activity, swallowing problems and dementia were all reasons residents may be at risk of malnutrition. The project started in January in three Neath Port Talbot nursing homes but now covers 14, including Bridgend and Swansea. It is hoped it can be rolled out across all 66 nursing homes in the health board area. 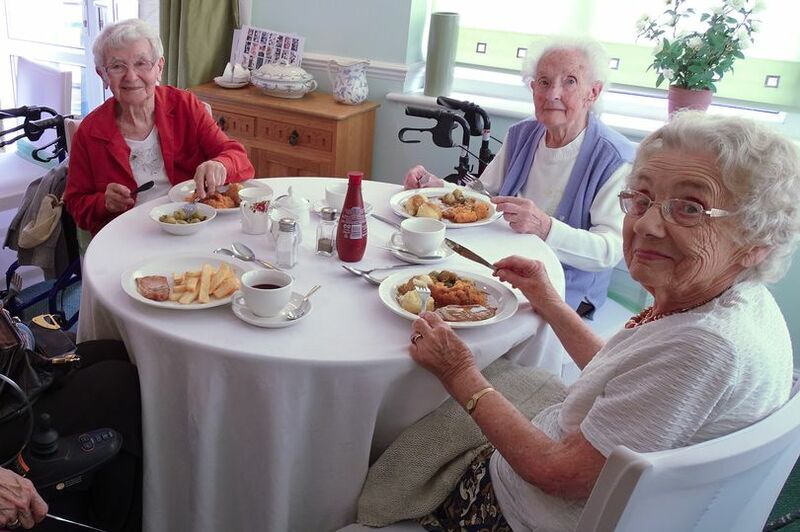 CFW member Swn y Mor Care Centre in Port Talbot took part in the scheme pilot – pictured on the right are residents Valmai Williams, Grace Jones and Hazel Owen tucking in to a delicious lunch.